Char No. 4, no relation to Chanel No. 5, must be Brooklyn’s—or at least Smith Street’s—first bourbon-centric whiskey bar and restaurant. You can sample over 300 whiskeys here but probably not in one ecstatic sitting, although, borrowing a page from the wine world, every tipple is available by the one-ounce pours. The name of the place refers to the practice of heating the oak staves used to make bourbon barrels. There are four degrees of char, No. 4 being the most intense. The smell of charring oak is said to be not unlike that of a good pit barbecue—fitting, considering chef Matt Greco’s southern comfort menu of house-smoked ham, a chopped-pork sandwich, and cheddar curds with pimento sauce. For Byron Bates, there are few things in life worse than a bad glass of wine. Not bad subjectively, bad objectively: too warm, improperly stored, and completely unsuited to whatever food it’s meant to accompany. As wine director of Café Select, the Swiss restaurant opening for lunch this week in Soho, Bates pledges to save his clientele (and his wines) from that fate, and has engineered what might be New York’s first Alpine wine list, to complement chef Jo Herde’s modern Swiss menu. By Alpine, by the way, Bates doesn’t mean exclusively Swiss: “The rule of thumb,” he says, “is you have to at least be able to see the Alps from the vineyard. You might need a telescope.” That translates into a refreshingly offbeat cellar that’s 20 percent Swiss and 90 percent biodynamic or organically produced, with selections from Austria, Germany, France’s Savoie and Rhône, and Italy’s Alto Adige, Valle d’Aosta, and Piemonte. The house wine is Côtes du Rhône in a box, and goes for $7 a glass, $14 a carafe. Bates describes his personal favorite, a Luc Massy Dezaley Chemin de Fer Chasselas, as “mineral, bright, and fresh”—the sort of quaff that won’t overpower Herde’s sweet and savory pies, wurst salad with hard-boiled egg, and beef bouillon with strips of crêpe. And what about customers who insist on something a bit more familiar? 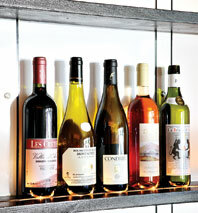 “When someone says, ‘I want Pinot Grigio,’ they don’t even want Pinot Grigio,” says Bates. “They’re sending you a message about what they want.” His job, as he sees it, is to elicit our unspoken oenophilic desires—and to keep the cellar temperature at a cool 58 degrees. Heath Ledger didn’t live to see his planned Greenpoint café, but this week, with funding from his estate, Five Leaves opens its doors to the public. The casual vibe might remind some of Cafe Gitane, the Nolita hangout where owner Jud Mongell and his wife worked for years. 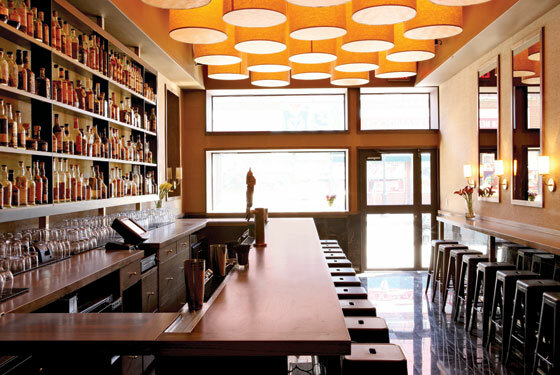 But the triangular space bears a much closer resemblance to Moto, the Williamsburg restaurant whose designers also collaborated on Five Leaves’ nautically themed décor. The bar is shaped like a ship’s prow; maritime scenes are etched into marble tabletops; and a gold-leafed porthole marks the WC. Cat von Klitzing, formerly of Prune, shares KP duty with Mario Hernandez, late of El Beit and Abraço Espresso. 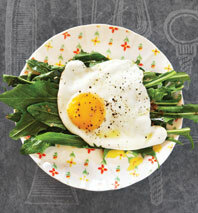 It was Hernandez’s masterful scrambled-egg-and-fried-sage breakfast sandwich that got him the gig, and it’s featured on the menu alongside salads like fried egg with dandelion greens (pictured).